In Part 1 of this interview with Dr. Dharma Singh Khalsa, M.D., who is president and medical director of the Alzheimer’s Research and Prevention Foundation and a clinical associate professor of integrative medicine at the University of New Mexico School of Medicine, we learned about how chronic stress affects our brains. Here in Part 2, Dr. Khalsa tells us about a specific form of meditation that has shown promising results in protecting the brain from the impact of stress that may develop into dementia. Dr. Khalsa’s article “Stress, Meditation, and Alzheimer’s Prevention: Where the Evidence Stands” has been published in an the Journal of Alzheimer’s Disease. meditation, called Kirtan Kriya, is helpful in preventing the disease. Could you please provide a brief overview of this practice as well as tell us how we can learn how to do it? Dr. Khalsa: Kirtan Kriya (KK) means singing exercise. Kirtan means singing, Kriya means exercise. It is a brain enhancing meditation exercise that is safe, affordable, fast, effective, and easy. It’s very easy to do and takes only 12 minutes a day to gain its many positive benefits. KK has effects on brain anatomy, physiology and behavior. It causes an increase in cerebral blood flow to significant brain areas and it decreases inflammation because it causes a down-regulation of inflammatory genes, while at the same time promoting health-promoting genes. KK also acts all the way down to the level of your DNA and has been shown to increase telomerase levels by percent, the largest increase ever reported. Telomerase is an enzyme that increases the length of your telomere, or the cap of your DNA. Long telomeres are associated with better health, longevity, and less cognitive decline, while shorter telomeres have the opposite effect. KK has also been shown in research at the University of Pennsylvania to improve memory in people with Subjective Cognitive Decline, and Mild Cognitive Impairment, while enhancing well-being. Moreover, long term practitioners have better functioning brains. In other research at the University of West Virginia, we’ve seen that people with Subjective Cognitive Decline and Mild Cognitive Impairment improved in their memory, as well as have better sleep. Sleep quality is important because poor sleep is a risk factor for the development of Alzheimer’s. KK is easy to do and only takes 12 minutes, and you can practice sitting comfortably in a chair. The link below provides exact directions. In my opinion, KK should be part of the conversation of the culture of prevention, right alongside diet, exercise, and socialization. CBB: After watching the video, Dr. Khalsa, I can see that this practice is relaxing and not difficult. Are other types of meditation that reduce stress as effective? **Dr. Khalsa:**All meditations are good. The basic Relaxation Response, in which a person can choose any technique they want, Transcendental Meditation, and Mindfulness Based Stress Reduction (MBSR) are all beneficial. However, they usually require prolonged periods of training and may be expensive. Moreover, KK is essentially free, requires no other training, and its effects are more precise and faster. CBB: Dr. Khalsa, you hold an important position in the Alzheimer's prevention community. You consider what you call spiritual fitness to be important to brain health. How does this work? 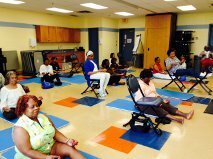 Dr. Khalsa: Spiritual fitness is a combination of psychological and spiritual wellbeing and is very important to transcending negative aspects of aging, including cognitive decline. Aspects of spiritual fitness, such as acceptance, environmental mastery, independent living, persistent personal growth, positive relationships, service, and having a purpose or mission in life have been revealed to diminish many bio markers of aging, including cholesterol levels. A sense of purpose has been shown to reduce the risk of Alzheimer’s disease. CBB: Dr. Khalsa, those of us who've witnessed loved ones stuggle with dementia often feel that we are next no matter what we do. You've offered us both help and hope. I thank you for your time and your information.